My love for tutu/ tulle dresses or skirts is out of this world. Anything tulle in a store catches my eye. This dress from H&M is fabulous, I found it on the Halloween selection and was reduced to £7. I love the simplicity, how elegant it looks on and the fact that I get to show off my legs Bouns!. I styled the dress with the gold wide chunky heels from Newlook that I got on sale too (£10). A little black dress is a must have but a black tulle dress is cream on the cake. In winter you get a lot of sales and offers, for me it's the best time to shop. I could like to know what you guys think about tulle dresses and skirts? 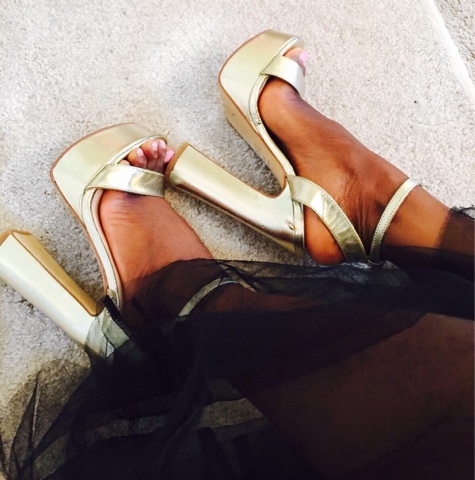 And how you style your tulle dresses?